Today was arguably the United Nations at its best. I know that sounds odd, since the day was dominated by the insane musings of Muammar Qaddafi. But while there is plenty wrong with the United Nations--and while liberals tend to overestimate both its moral legitimacy and what it can realistically accomplish--the international body does serve at least one genuinely valuable function: It provides a place where leaders and their representatives can gather in one spot and speak their minds--clarifying for the world who these leaders are and what, exactly, they believe. That was what happened today with Qaddafi. Conservatives will probably offer his 90-minute-long rant as more evidence for the pointlessness of the U.N. But I would argue that it proves the opposite. 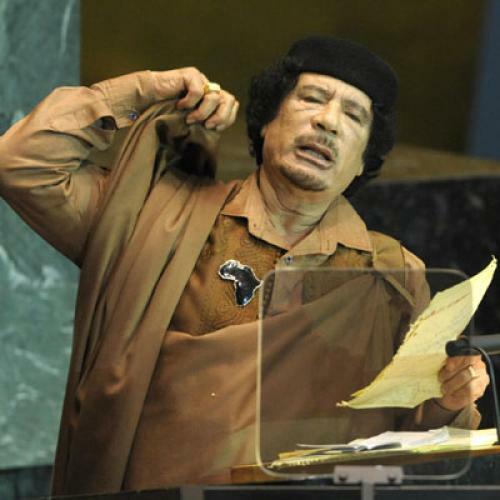 It's been all too easy to forget in recent years that Qaddafi is an unadulterated lunatic. He agreed to disband his nuclear program back in 2003. He got published on the op-ed page of The New York Times. (Then his son did.) He became head of the African Union, and other African leaders seemed perfectly willing to ratify the veneer of respectability he was acquiring. An anecdote that illustrates this: In June, as part of a group of journalists traveling with the International Reporting Project, I met Kenya's prime minister, Raila Odinga, at his home in Nairobi. I asked Odinga whether he thought the African Union--given that it was now headed by Qaddafi, a notorious human rights abuser, and given how many other dictators were part of the organization--could possibly play a constructive role in promoting human rights. In response, he offered a persuasive critique of the A.U., pointing out that some African leaders were hesitant to criticize each other on human rights because of their own records. For instance, he said, "people like Robert Mugabe will be treated with kid gloves" at the A.U. "Why? Because a number of the heads of state going there are carrying the same baggage, like Mr. Mugabe. You'll find one of them, President Bongo of Gabon, will say that, 'Oh, Mr. Mugabe, he conducted elections--one election--therefore he's the president.' You see? Because that is what he does in his own country." A good answer, I thought. But while Odinga had called out Mugabe and Bongo, he had not mentioned Qaddafi, the one leader about whom I had specifically asked. So I followed up: "Are you frustrated that the organization is led by Qaddafi?" At which point, Odinga smiled, and said simply, "I don't want to comment on the head of a state which has got a diplomatic relationship with Kenya." So there you have it: For the number-two official in Kenya--a country that is one of the key players in African politics and a democracy--Mugabe and Bongo (who, it so happens, died the next day) were far enough outside the realm of respectability that they could be safely criticized. Qaddafi, apparently, was not--even though he is every bit the brutal dictator that Mugabe is and Bongo was (Libya is actually less free than Zimbabwe or Gabon, according to Freedom House), and even though he himself has not extended much courtesy to his fellow African leaders over the years (for instance, during his decades-long bid to conquer Chad). Which brings me back to the United Nations. Qaddafi's rant today was so embarrassing (introduced as the "King of Kings of Africa," he held forth on topics like the JFK assassination and the origins of swine flu) that it should help to remind the world just how crazy he is, and just how little he deserves the aura of quasi-respectability he has somehow acquired. And if that happens, then hasn't the United Nations arguably done a valuable service--simply by giving a nutty dictator the stage and letting him tell us what is on his mind?